i always enjoy trying new types of food and making new recipes. i absolutely love traditional chocolate chip cookies. they were a staple dessert growing up, and they always remind me of my family. you just can't go wrong with a classic like that. 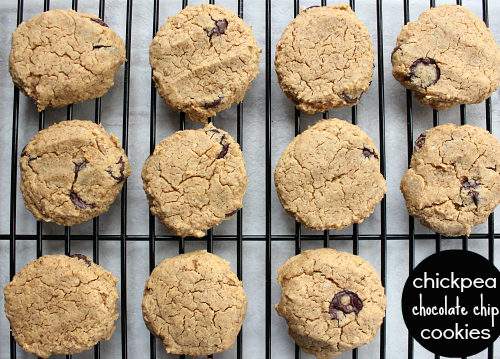 so, i was intrigued and curious (and even a little bit skeptical) when i came across this recipe for chickpea chocolate chip cookies. this recipe doesn't have any flour, eggs, butter, or milk in it, making it vegan, dairy free, and gluten free. since i have been exploring cooking/baking more vegetarian and vegan lately, i thought i would give them a whirl. it always amazes me how ingredients can come together. i would have never thought of making a cookie out of chickpeas, but it actually worked. i have tried several vegan and gluten free recipes that ended up tasting like cardboard, so i was pleasantly surprised that the flavor of these cookies was so good. i certainly won't be replacing my traditional chocolate chip cookie recipe with this recipe any time soon, but it is a great alternative if you are watching what you eat or if you have to whip up a dessert for friends on restricted diets! preheat your oven to 350 degrees F. in a food processor, combine the chickpeas, almond butter, coconut, oats, maple syrup, baking powder, and salt. puree until smooth. fold in the chocolate chips with a spatula. 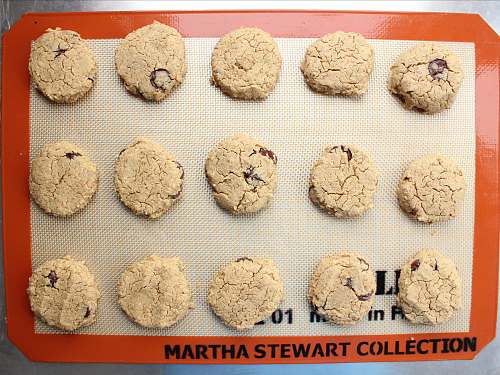 scoop the cookie dough by the tablespoon onto a cookie sheet lined with parchment paper or a silpat baking mat. flatten the dough balls to look like traditional cookies. bake for 18 minutes. 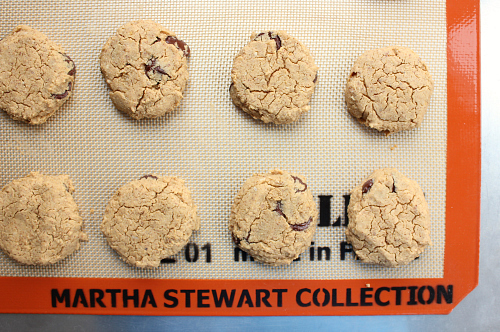 Surprisingly, they look like chocolate chip cookies. If I had seen the recipe, I don't think I would have made a whole batch for ourselves, but certainly would try one. I wonder what Jeff is thinking about this recipe?